If you spot a puddle beneath your vehicle, you first need to determine whether the liquid leaked from your car. When you've determined that your car is the source, take a closer look at the fluid's color. To accurately gauge the color, place a piece of white paper or cardboard beneath the leak, and let it catch a few drops. When your car has a fluid leak, the fluid is likely to be water, coolant, motor oil, transmission fluid, gear oil, or power steering fluid. 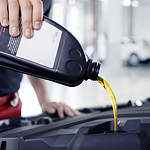 Each fluid has a particular color; motor oil has a brownish hue, and transmission fluid is usually red or pink. Coolant comes in a rainbow of colors, ranging from blue to red, but green is most common. Once you've identified what type of fluid is leaking from your car, you can decide how to tackle the problem. When you're looking for mechanical tips or quality used cars, come to Philpott Pre-Owned Super Center for a test drive.